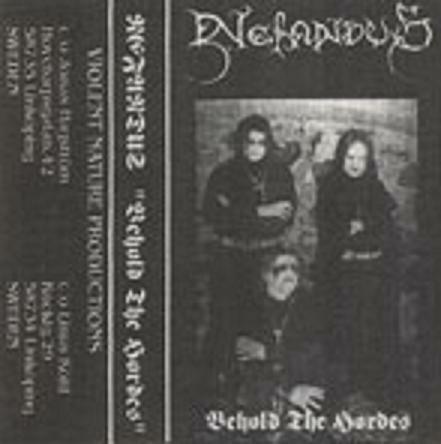 Would anyone be able to scan the back cover of Armaggedon/Necroplasma/Épuration Satanique split? Can someone provide a scan of the insert for Bathory s/t lp Under One Flag edition? Woods of Infinity - I-20 insert? Bought the 7" as used and the insert is missing. Could anyone scan my a high resolution pic of Gehenna - Second Spell LP (original) ? Also, does anyone know if the tape that came with the Death By Metal diehard reissue is exactly like the original? The only pictures I've seen of it only show the cover. I am looking for a variation of Possessed´s - Seven Churches cover. A different font was used for "Seven Churches", more rounded compared to the original/known one and the letters were divided horizontally (like being crossed out three or four times). While I am not entirely sure I think this has been the cover for a US cd version - not the price killers pressing. - Scan of the A3 insert (the one that was telling how Seraphic Decay ripped them off) that was on the second pressing of INCANTATION - Entrantment Of Evil 7"EP (http://s.dsimg.com/image/R-537395-1346125100-8944.jpeg)? If someone has it twice (the insert, i already own the 7") i will pay good money for it, thanks! does anyone have this iron maiden promo leaf and willing to scan it for me? if possible in 150 dpi please! Please, anyone can scan this cover (in a decent quality) ? EDIT: need also a copy of: Archgoat-Jesus spawn demo cover! Yes, thanks in advance ! I also need INCANTATION Reh/demo 1990, best resolution possible ! Could anyone scan the booklet for the Transfigurations split between Kriegsmaschine and Infernal War?